After several weeks of travel, and Thanksgiving week, I am getting caught up on editing and posting more images from recent monastery visits. First up, several photographs from Hermitage of the Holy Cross (ROCOR). My thanks to Fr. Abbott Seraphim and guest master Fr. Hilarion, and the several monks I was able to speak with during my brief stay. This was a “get acquainted” visit, as a tentative commitment set up back in the Summer suddenly materialized and forced me to shorten my stay at Holy Cross, but I do look forward to return visits during the different seasons. Please head over to the special Holy Cross Gallery to explore the images, and to learn more about this thriving men’s monastery, which continues to grow and expand. I was deeply honored to be invited to speak about the North American Thebaid Project at the OCA’s recent Monastic Synaxis. The superiors, led by His Beatitude Metropolitan Tikhon, and Archbishop Nathaniel, had numerous excellent questions and insights, all of which further improve the Thebaid Project, and help it support monastic life even more than before. Based on conversations and personal invitations from several of the superiors, I sensed a real interest in the Project, and I very much look forward to visiting the many monasteries in the OCA. 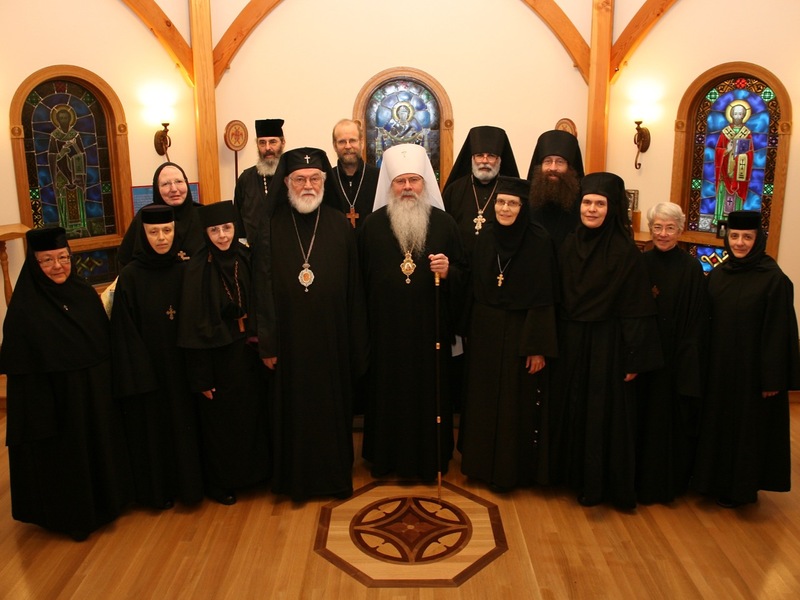 2016 OCA Monastic Synaxis; Photo by Ralph H. Sidway. With the blessing of their diocesan bishops, superiors of monasteries of the Orthodox Church in America gathered at the Monastery of the Holy Transfiguration here October 25-27, 2016 for their third annual Synaxis for the purpose of strengthening monastic life in the OCA while providing a forum for the superiors to meet and share their respective communities’ joys and challenges. The Synaxis opened with the celebration of the Vigil and Divine Liturgy for the feast of the Great Marty Demetrius. His Beatitude, Metropolitan Tikhon, who oversees the stavropegial monasteries, and His Eminence, Archbishop Nathaniel, in whose diocese the Monastery of the Transfiguration is located, were present for this year’s meeting. Mother Capitolina, Superior of the Protecting Veil of the Theotokos Community, Anchorage, AK. Mother Cassiana, Superior of the Holy Protection Monastery, Lake George, CO. Sister Cecelia, Prioress of the Nuns of New Skete, Cambridge, NY. Brother Christopher, Prior of the Monks of New Skete, Cambridge, NY. Mother Christophora, Abbess of the Monastery of the Holy Transfiguration, Ellwood City, PA.
Igumen Gabriel, representing Archimandrite Sergius, Abbot of the Monastery of Saint Tikhon of Zadonsk, South Canaan, PA. 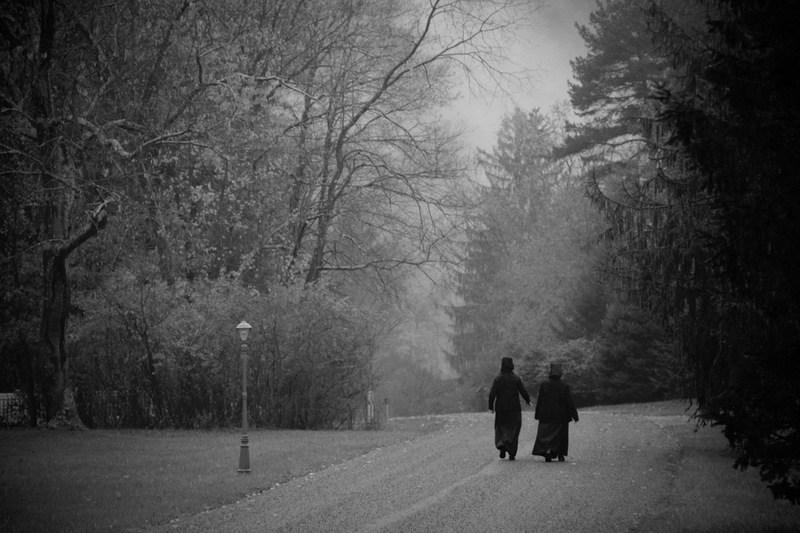 Mother Gabriella, Abbess of the Holy Dormition Monastery, Rives Junction, MI. Archimandrite Gerasim, Abbot of Saint Elias Hermitage, Smoky Lake County, AB, Canada. Hieromonk Innocent, Superior of the Monastery of Saint John of Shanghai and San Francisco, Manton, CA. Mother Melania, Superior of Holy Assumption Monastery, Calistoga, CA. Mother Sergia, Abbess of the Presentation of the Theotokos Monastery, Marshfield, MO. Mother Thekla, Abbess of the Mary and Martha Monastery, Wagener, NC.